The Darke County Community Christmas Drive raised more than $32,000 for local community and charitable organizations in 2018. DARKE COUNTY – The Darke County Community Christmas Drive raised more than $32,000 for local community and charitable organizations in 2018. Starting the weekend after Thanksgiving, donations were taken in at 11 locations throughout the county, with most accepting funds between 10 a.m. and 8 p.m. each Friday and Saturday between Nov. 24 and Dec. 22. Donations were solicited via bell-ringing at the KitchenAid store in downtown Greenville, Eikenberry’s IGA, Walmart, Kroger, Rural King, Dave Knapp Ford, Greenville Federal, Sutton’s Super Value in Arcanum, Greenville National Bank in Ansonia and the New Madison Mini Mart. This year’s drive took in a total of $32,091.61, with $6,725 apiece going to Fish Choice Pantry, a food bank located in Greenville, and Grace Resurrection Community Center, which operates as a soup kitchen as well as a food and clothing bank. 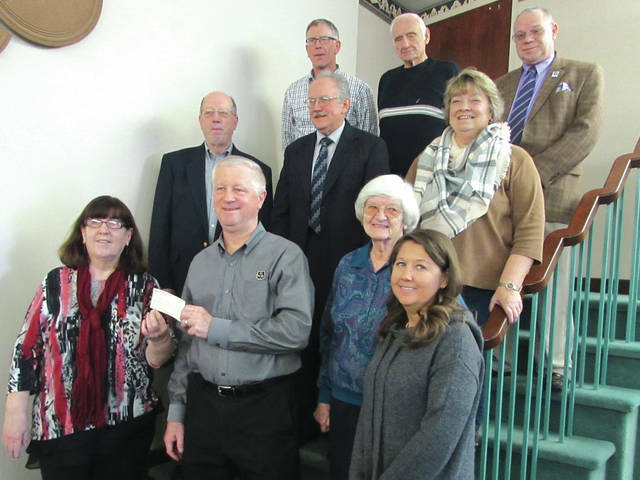 The Salvation Army, Faith United Methodist Food Bank in Arcanum, Ansonia Methodist Food Bank and Castine Area Food Bank each received $2,241.67. Donations received at Kroger and Rural King were divided equally between the Darke County Community Christmas Drive and the Salvation Army. Fish Choice director Kristy Cutarelli expressed gratitude for the funds received from this year’s Christmas drive. “Without this kind support, we wouldn’t be able to keep the doors open,” Cutarelli said. The Christmas Drive is co-chaired by East Main Church of Christ pastor Jim Morehouse and fellow pastors Joe Soley and Mel Musser. The drive was started in the early 1990s by the Greater Greenville Ministerial Association, according to Morehouse, and involves the efforts of more than 20 local organizations. Morehouse has participated in the drive for the past 10 years. Morehouse had words of thanks for employees at Greenville National Bank in downtown Greenville. The most important aspect of the drive, Morehouse said, is to show concern for those who need help within the community. Bell-ringing duties were carried out by volunteers from local churches, including Coletown Christian, Greenville Missionary, St. Paul’s United Church of Christ, St. Paul’s Lutheran, St. Paul’s Episcopal, Bible Fellowship, First United Methodist, Stelvideo Christian, East Zion, Trinity Wesleyan, Greenville Church of the Brethren, Evangelical United Methodist, First Presbyterian, Beamsville Christian, Fort Jefferson, Cedar Grove, New Madison United Methodist and First Universalist Church in New Madison, according to Morehouse. The drive also received help from the Lions Club, Rotary Club, Kiwanis, the Castine Church of the Brethren, Faith United Methodist, the Community of Faith Church, Oakland Church of the Brethren, St. John’s Lutheran Church and St. Mary’s Catholic Church. No money was paid to any of the volunteers, and all of the proceeds will remain in Darke County. Co-chairman Joe Soley will step down after this year, he said, but that doesn’t mean he won’t still continue to participate in the drive. This entry was tagged Ansonia Methodist Food Bank, Beamsville Christian, Bible Fellowship, Castine Area Food Bank, Cedar Grove, Charity, Christmas, Coletown Christian, Darke County Community Christmas Drive, East Zion, Evangelical United Methodist, Faith United Methodist Food Bank, First Presbyterian, First United Methodist, First Universalist Church, FISH Choice Pantry, Fort Jefferson, Grace Resurrection Community Center, Greenville Church of the Brethren, Greenville Missionary, Kiwanis, Lions Club, New Madison United Methodist, Rotary Club, Salvation Army, St. Paul’s Episcopal, St. Paul’s Lutheran, St. Paul’s United Church of Christ, Stelvideo Christian, Trinity Wesleyan. Bookmark the permalink.